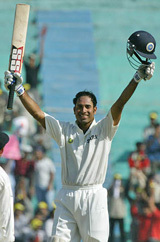 V.V.S.Laxman was not considered for the 2003 World Cup as well as the subsequent TVS Cup in Bangladesh in the 2002-03 season. He made a comeback to the Indian one-day squad during the TVS Cup in India in October 2003. Since then, he has missed just four matches due to injury. The "Very Very Special" batsman now finds himself out of the one-day side for the Bangladesh tour. Some people have tried to justify his omission by referring to his 'inconsistent' batting and 'mediocre' fielding. However, the stats tell a completely different story, as he has taken more catches since his return than in his earlier stint (19 catches in 32 matches as against 20 catches from 51 matches earlier ). He has also scored more centuries and has been India's third-highest scorer since his return to the one-day side!